Welcome to April’s Secret Recipe Club Reveal! In SRC, members are assigned another blog, search through the archives, bake up something delicious, and share it on reveal day! I was assigned Maxine’s blog, Why Am I Not Skinny? Haha – what a great name for a food blog! Maxine is a South African blogger living in Brussels, Belgium. And she loves food, especially desserts! There were so many delicious recipes to choose from! I actually made her Chicken & Broccoli Bake, but it was right after Easter, so I swapped out the chicken for ham and then I felt bad for changing the main ingredient for a SRC reveal. It was super delicious, so I blogged it separately and started looking again! This time my eye was all for the desserts. Like this amazing Orange Ricotta Cake! Or Lemon Poppy Seed Cake! Or *be still my heart* Cappuccino Cake!!! So I went half way and made Maxine’s amazing pancakes! I made the recipe exactly as Maxine did (I even weighed by ingredients!) but I renamed them crepes (sorry, Maxine!) because I’ve always thought of flat pancakes as crepes – maybe it’s a US thing? My boys went wild for these! Plus they were super easy to make! There was a bit of a learning curve when cooking, but only one casualty, so I call it a win! I also loved that these pancakes/crepes were served simply, with just a bit of butter and cinnamon sugar. 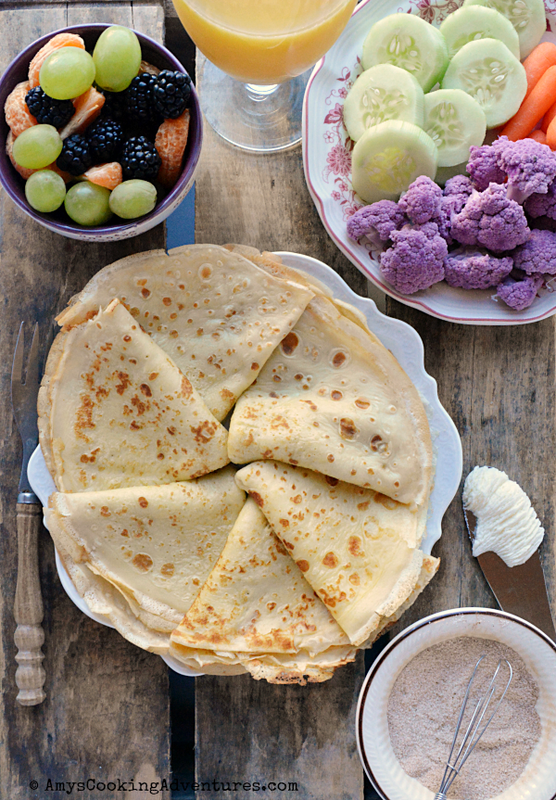 The simple ingredients let the lovely crepe shine through instead of being buried cream cheese and/or fruit. I went the brinner (breakfast for dinner) route on these, so I served them with a side of fruit and veggies! It’s simple and delicious and perfect for Sunday brunch (or brinner)! Recipe from Why Am I Not Skinny? Make a well in the center of the flour. Crack both eggs into the well. Add the oil, and about 2 tablespoons of milk. Whisk the mixture, gradually incorporating the flour until the mixture becomes a thick paste. Add the rest of the milk and whisk vigorously until the mixture is very smooth. Set aside to rest for 20 minutes. Heat a 10-inch nonstick skillet over medium heat (brush very lightly with butter, if desired). Pour ¼ cup of the crepe batter into the hot skillet and swirl to evenly coat the bottom of the pan. Cook for about 1 minute or until the crepe is fully set on top and the edges just begin to brown. 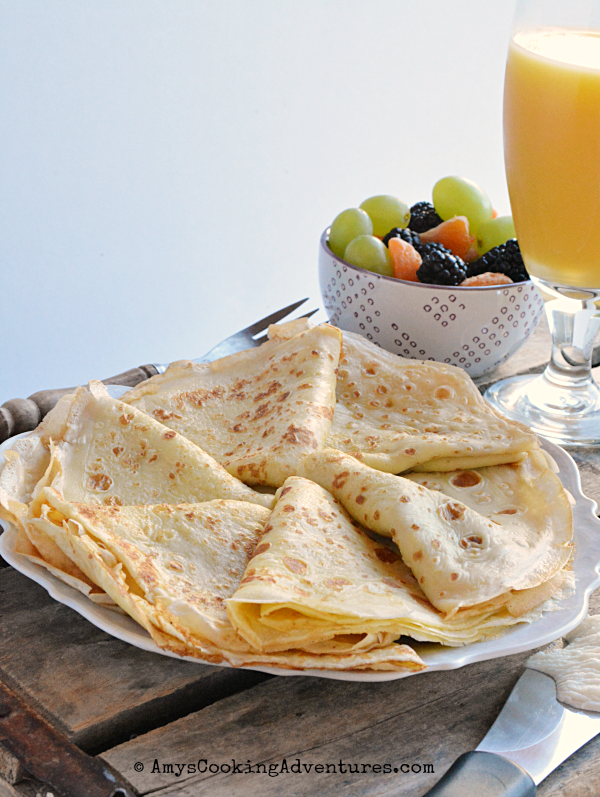 Use a rubber spatula to gently loosen the edges of the crepe. Then slide a spatula under the crepe and quickly flip. Cook for another 30 seconds then remove to a plate until ready to eat. Repeat with the remaining crepe batter, turning the heat to medium-low, if needed. Serve with desired sweet or savory toppings. I served these crepes with butter and a sprinkling of cinnamon-sugar. Mmmmm...I love anything with cinnamon and sugar...so tasty! Brinner! Genius, Amy. I love these. Yours look amazing. Thanks for posting with the SRC. thank you!!! you really did these justice!!! I love "brinner," great choice! I usually leave the crepe making to my son, but since he's been away at college, I haven't been able to enjoy them very often. I need to give this recipe a try. The crepes look just perfect! Beautiful! I haven't made crepes in years! I should give these a try! Great SRC choice. These sound both light & delicious! I think having a little fresh fruit or even a lemon curd with them would be delightful for dessert.